Oxygen Mask without Tubing features a clear soft vinyl construction with a cotton coated strap. The design provides patient comfort with accurate airway assessment and management. 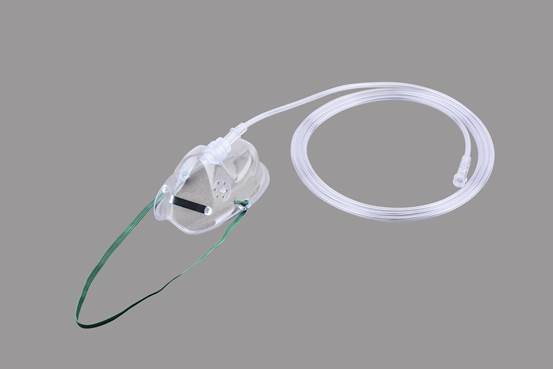 The Simple O2 mask also features a newly designed softer tubing connector for an easier fit. Being the leading names in the industry, we offer Oxygen Mask without Tubing. If you have any questions about our products, please feel free to contact us, we will be the first time to reply. We are committed to your 100% satisfaction. Oxygen Mask without Tubing are latex-free and made from soft, high-grade vinyl resins.The smooth, feathered edges are designed for patient comfort while reducing irritation points. · Disposable Single patient use. · Oxygen Mask is used for convenient oxygen supply. · Be light in weight, they are more comfortable for patients to wear. · Manufactured from soft non toxic, medical grade PVC Compound. · Adjustable elastic strip and integrated nose clip for proper positioning of mask.